I am more leery with Doctor #1 being not just a crotchety old man but talking down to Doctor #12 because of it. I mean, Time Lords must be used to people being so many centuries older than them while looking younger. I even imagine meeting a future/past incarnation of yourself may be not entirely out of the realm of possibility (how many times have the Doctor done it after all?). We start going back 709 episodes ago (and am I the only one geekily thrilled by that number? And am I further the only one living in horror of the fact I haven’t watched half of these and now I need to watch them all! MUST WATCH THEM ALL) with a really really good mash up of original footage and modern actors playing the role of Doctor #1 and Polly and Ben. Way back then, Doctor #1 is also resisting the urge to regenerate, same as Doctor #12 - and both of them end up together in Antarctica. This is another major theme of this episode wove subtly through it: The Doctor matters. He is important. Doctor #1 is not amused by how the Tardis has been redecorated. Nor about regenerating without a little more youth. The Captain is also quite upset by Doctor #12 referring to World War “One”. oops, spoilers. They are captured by the alien species behind the time shenanigans and pulled on board their ship - The Chamber of the Dead which has advanced time travel technology and people made of glass (again interesting look at how the Doctors operate: Doctor #12 waving around his Sonic Screwdriver while Doctor #1 examines the glass being closely and sees it’s asymmetrical: a computer generated construct would not be). Doctor #1 is also very very disturbed to hear that he’s referred to as “The Doctor of War”. “Her” would be Bill - and damn I hoped. Yes I hoped. I really hoped that some wand had been waved and she was back with us. Yes I wanted this - and so did Doctor 12 who ran down to embrace her. Before facing reality: Bill became a Cyberman. She sacrificed herself to save people she barely knew. This isn’t Bill - and the Doctor considers any imitation of Bill in all her awesomeness to be an insult, a mockery and intolerable. I kind of agree with him a lot. But also want Bill. So much want Bill. But he exposes this by pointing out the huge holes in her memories. He walks from her, demanding to know who is stealing the faces of the dead. And Doctor #12 is certainly not having that either. In fact he announces to the Testimony that they’re definitely going to escape and then he’s going to find out what they’re doing and if he doesn’t agree with it he will STOP THEM! Doctor #1 is horrified by all of this: he asks who he he thinks he is, why he’s boasting and why he has to announce his plans to everyone?! Basically, Doctor #1 is nervous and risk averse. Doctor #12 is arrogantly confident of his own ability to make entire species back down in the face of his own Awesomeness. And he’s not entirely wrong. And I just love to see this character growth so clearly written large. Testimony responds with memories and images from all of the Doctor’s 12 incarnations much to the growing horror of Doctor #1 as he hears the many terrible titles the Doctor has earned and truly what the “War Doctor” means. They do escape, because Doctor, and head to Doctor #1’s Tardis (and hats off to Doctor#12’s “over to you Mary Berry”. All Hail Mary Berry). The plan now is to track down whose face the glass-woman Testimony is wearing and to do that they need access to a huge database of people’s faces. Time to travel (and yes, Doctor #12 can fly the Tardis better). They land in a horrible dystopian world full of face huggers where access to this database is - owned by someone who hates the Doctor. 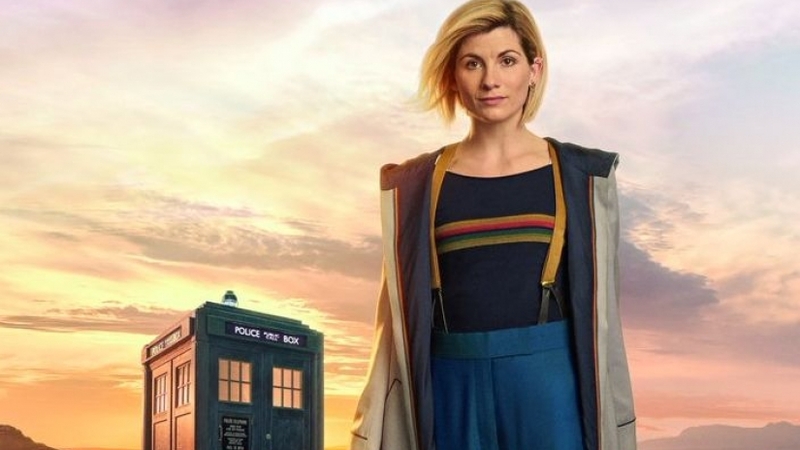 Doctor #12 leaves Bill and the Captain behind after a heartbreaking moment with Bill clearly wanting to believe she’s real but knowing she isn’t - and it seems sadly he’s right as when he’s not watching her she has a glass-body. The Doctor #12 does use his dying body as a way to get to see the boss since they’ll want to see him die in person; leaving Doctor #1 behind so the database can’t kill two of them and cause a very very very messy paradox. The Database is a Dalek - because all Dalek’s are connected to the Dalek hive mind which is huge beyond huge. He is the Only Good Dalek - (he objects to this: he declared the Doctor is a good Dalek since he’s good at the whole genocide thing). This is a Dalek that the Doctor and Clara had all kinds of shenanigans with in the past. He’s willing to talk to the Doctor (and even ripped off his gun to talk to him) and give him access to the database since it will hurt the Daleks which he’s definitely here for. While he gets that answer; Doctor #1 talks with fake Bill about why he left Gallifrey: he says he was looking for an answer about good and evil. Because evil should always win: good is not practical so how does it prevail? Bill answers this by postulating that there’s “some bloke” wandering around space and time putting things right when they go wrong holding everything together. Doctor #1 finds this dubious and asks if any of his future incarnations has learned that lesson - and Bill thinks no. That Doctor #12 and all the Doctors before haven’t truly grasped the effect and power he has on the universe. Though everyone who has ever met him knows. Which is when Doctor #12 gets his answer from the database about the Testimony: they use time travel to harvest memories - copy the memories of people who nearly died so they can be remembered forever and even uploaded into glass bodies so people can interact with their dead loved ones and ancestors. Which is… awesome. And… good? Which is when Doctor #12 confronts Bill to learn, YES she is Bill Pots, no she isn’t a spy and yes she is Testimony. Since she is made up of all of the memories of Bill then she is Bill - what else is a person but the sum total of their experiences and memories. Also she reminds him not everything is evil - he isn’t the only kind one left in the universe. They agree to return the Captain, even though Doctor #12 is torn over losing someone else, on top of his endless sea of loss. But because he’s the Doctor and knows his dates, the Captain isn’t returned to his death - but the beginning of the Christmas Truce, therefore saved. That captain is also a Lethbridge-Stewart. That would make him part of the Brigadeer’s family (I’m not going to say who the Brigadeer is; because you know). That leaves Doctor #1 and Doctor #12 time to talk - with Doctor #1 moving on from his fear of regenerating since he can see what one day he will become and he likes that. He also learned what “War Doctor” means: a doctor who will enter a war zone and save lives. Which is nice and noble, but the Doctor also earned that title by literally wiping out entire armadas. I also wonder at this point - given his time shenanigans and extra regenerations- what is the usual lifespan of a Time Lord? Does the whole species commonly live for 2,000+ years? I think we have themes established for the next season: The Doctor is a force for awesome good in the universe. But he’s also Tired. Very very very tired: tired of loss, memory and still going. Tired of being the answer to that question: “how does good prevail”? To the point of Bill having to remind him that there are other kind things in the universe; which is a lesson only someone really really jaded needs to learn. Or someone watching the news in 2017. And then Doctor #13 arrives and she pushes a button and the Tardis all goes wrong over London. The very first neckbeard who spouts a joke about female drivers will be castrated with rusty garden shears.